This post is sponsored by Moose Toys. Nighttime fears and difficulties going to or staying asleep are a normal occurrence for children of all ages. Anxiety, heightened emotions, their developing imagination and even over-tiredness can all contribute to children’s sleeping difficulties. As the mother of one preschooler who has trouble staying asleep throughout the night, and one primary school aged child who regularly has trouble falling asleep, I have tried lots of different ways to combat our ongoing sleeping difficulties because to be honest I need my sleep. So here are 11 things that I would encourage you to consider if you also find yourself in a position of having to help your young child to learn to overcome bedtime fears or anxiety. One of the most important outcomes of time for play is its capacity for combatting stress and anxiety in children. Ensuring your child has regular time available for free play, particularly time to spend outdoors, is one easy way to provide your child with an opportunity to de-stress. As with adults, it is important that children have time to talk about the experiences of their day. Which is why many mental health professionals advocate for regular family mealtimes. Making family mealtimes routine provides your child with the knowledge that they have a regular opportunity to talk through any problems or concerns with you when they feel the need to. When your child shares anxiety about a situation, whether it be at dinnertime, bedtime or another time, it is important to listen without judgment, to respond calmly and to be reassuring in your response. Do not dismiss your child’s fears or concerns, but where appropriate help them to brainstorm solutions or to focus on positive possibilities. It’s important to develop a consistent bedtime routine that provides your child with the opportunity to transition from the busyness of the day to a more relaxed and sleepy disposition. Make sure the evening is as calm and unrushed as possible. 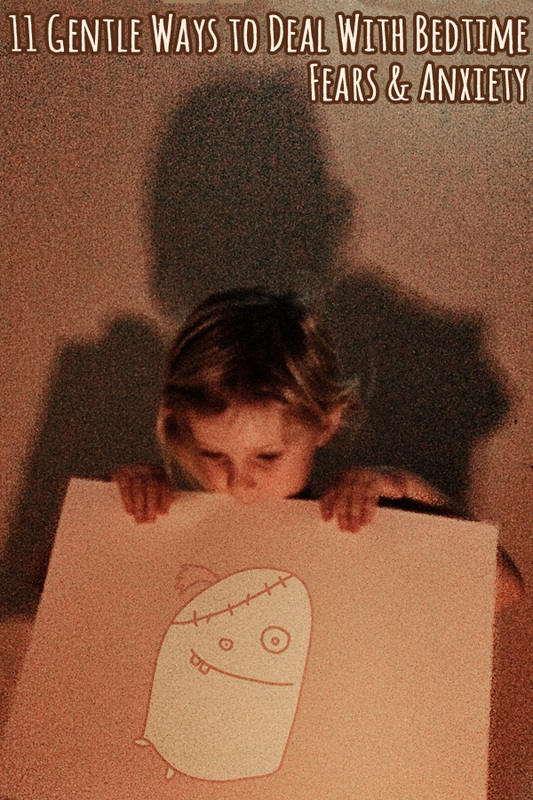 Set a bedtime and stick to it. Calm your child once they are in bed with a story, time to talk and/or a favourite bedtime song. And for children who share a bedroom, check out these great tips for making bedtime work. Consider adding a series of simple yoga stretches to your evening routine. As children encounter regular emotional, social, and physical challenges or conflicts, yoga can help them learn to relax in the face of such challenges. Our Move to Calm Yoga sequence provides a simple, calming place to start. I was skeptical when a friend suggested we play soft, calming music in our poor sleeper’s bedroom during the night. Amazingly, it helped three-year-old AJ turn a corner almost immediately, calming her enough when she stirred through the night to encourage her to fall back to sleep. By. Herself. Major breakthrough! For children who have a hard time falling asleep, providing them with something to focus on as they lay in their beds can help to distract them from the thoughts that may be keeping them awake. 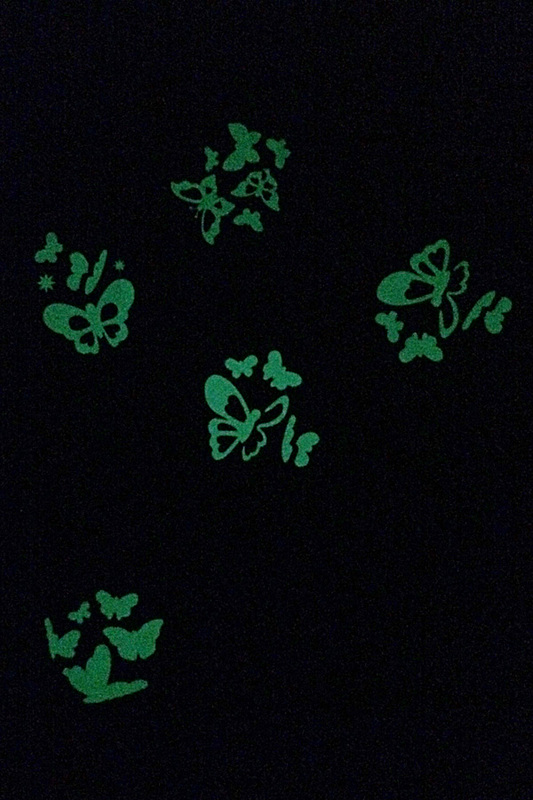 I love glow in the dark stickers for this purpose and will often suggest Immy count the stickers or make up a story in her head about them in an attempt to calm her mind to sleep. For those who don’t like the idea of sticking stickers to their ceiling or wall, Moose Toys has released a fabulous Glow Show range of glow in the dark stickers that can be easily removed. Game changer! The stickers are currently available in three designs – Bright Butterflies, Star Galaxy and Spooky Glow. Picture books can provide a wonderful means of opening discussion with your child about their feelings, emotions and concerns. Check out this list of book recommendations as a starting point for talking about managing big feelings with young children. Alternatively, look for books that address the specific concerns that your child has – whether it be bullying, feeling different or not fitting in, concern about school performance, or whatever else it might be that is causing them distress. Taking a familiar soft toy or comforter to bed each night isn’t just for babies. Even children who have been fine sleeping without a bedtime friend for some time might like the reminder to sleep with a comforter when they are going through a rough patch. 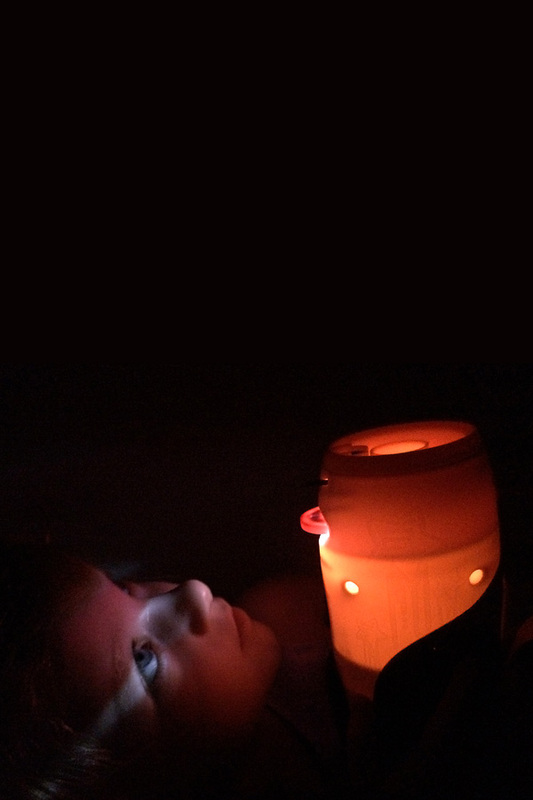 If your child is afraid of the dark, providing a low wattage nightlight may provide just enough illumination to reassure them that they are safe and well in their bed on waking during the night. Like yoga, learning to control their breathing can be a helpful practice for children who are struggling to relax to fall asleep. These breathing exercises and this collection of mindfulness apps are both tools that can help children focus and calm wherever they are…including when they are in bed. When your child does do well in facing their fears or anxieties, it is important to acknowledge their success. Celebrate those occasions they do manage to overcome their fear and anxieties at bedtime with lots of positive words of encouragement. We do a lot of what you've suggested here plus, when my child comes out to tell me she can't sleep, I take her back to her bed, tuck her in, tell her to close her eyes and keep them closed and I'll come and check on her in 15 minutes. Knowing that I'm coming to check on her is usually the security she needs to relax and fall asleep. Consistency and predictability in the night time routine helps my boys. We are also using music at night which has stopped our restless one from getting up constantly, they love to lie in bed and listen to it. I find specifically addressing concerns and redirecting an overactive imagination helps. We use a dream catcher to catch the bad dreams - it gives a visual to focus on as well as something to think about. Imaginative role play games just before story time has helped, I think. She acts out many of her frustrations through her fluffy animal toys and our interaction gives her the attention, reassurances and listening ears she needs to feel secure. Thanks for the tips, we're doing many of them but it's certainly the most challenging part of our day. When my 3yo has trouble falling asleep I softly sing him a song about a fun day we recently have had. I choose a familiar nursery rhyme and then make up the words to that tune. I start at waking up and sing through everything that happened that day until falling asleep at night. It is a long song! It calms him instantly and he will usually go to sleep without fuss afterwards. Aaargh! This is one of my biggest frustrations at the moment with one child. We have tried lots of things... saying a special prayer to keep bad dreams, bad feelings, monsters, robbers, tigers, dinosaurs, witches and everything else that is bad in the world away helps a little bit, as does an extra long cuddle. We are dealing with this RIGHT NOW. Thank you for these helpful suggestions! Music & yoga both worked for our non-sleeper! Such a challenge for families to work through -- it's hard to be patient when everyone's tired. These are such great strategies! Bedtime stories are great for making kids sleepy and ready for bed. In the past when one of my three young daughters has had difficulty sleeping, I found that a "Monster/Nightmare Spray" is very effective. it's simply a spray bottle that I fill with water, a couple of drops of food colouring, a couple of drops of an essential oil, and some glitter. I then put a couple of sprays around the bedroom to rid the room of "monsters" or "nightmares." It works every time! You can't beat a consistent, relaxing routine. Story time and snuggle down time and wind down time almost put me to sleep. We swear by the music. Our children are 8 and 6 and we have been playing the same music at bedtime since they were babies. It's so handy, we have the same music on our iPads and the 8 year olds iPod so we can even play it on holidays. The 8 year old used it on her iPod with head phones on a long haul flight this year too. When my sons a little scared I leave the cat in his room with him and tell him our dogs are just outside his window. They are guarding him and his animals will keep anything bad away. We do most of the tips you have mentioned above. If my children are too excited or worked up to drift straight off to sleep I rub their back slowly and gently for 5 minutes with no talking aloud. I find this calms them down, chills them out and helps them to drift off. We have a 10 year old child who is often very anxious at night we play games to keep his mind busy scrabble and hangman and some shared reading like you read a page I read a page and talk about plans for the weekend or what we did that day. We tell stories about our pets and sometimes we bring our husky puppy in to stay until he goes off to sleep. Taught my child to talk to himself or to talk to the ghosts etc that he was scared of, either to talk & be friends with them or to tell them to come back another time I'm busy now trying to rest & get some sleep. Along with a night light & a book to read in bed, this did the trick. Ps he was scared of the dark until at least age 13 yrs, he's now 17 & not scared of anything! My 6 year old really finds it difficult to sleep at night on his own .To motivate him we have recorded lots of rhymes in my and his voice and at night he is allowed to listen to them over and over again to calm him down. It works most of the days and on other days i go in to his room and put him back to sleep by rubbing his head. These are all wonderful tips. BUT...have you addressed the child who won't sleep unless Mom or Dad lie down with them for an extended period? Thank you so much for this article. My 9 year old is getting worse every year instead of better and we are exasperated! I have to sleep with her every night at the moment and as of this week, since hearing about an old urban legend - she is frozen with fear and won’t go anywhere in the house at night without me - even when the lights are on!